Tue., Feb. 5, 2019, 2:49 p.m.
CLE ELUM, Wash. – Tammy and Jeff Grimnes looked forward to their daily interactions with Buttons the elk. For many years, Buttons would stop in the enclosed porch of the Grimnes’ home several times a day. Nate Tamarack was not as fond of Buttons. Tamarack, who now lives in Idaho but spends several months in Cle Elum working as a fly-fishing guide, said Buttons would get into his boats and try to eat things out of them. She also approached his customers and made them uncomfortable, he said. 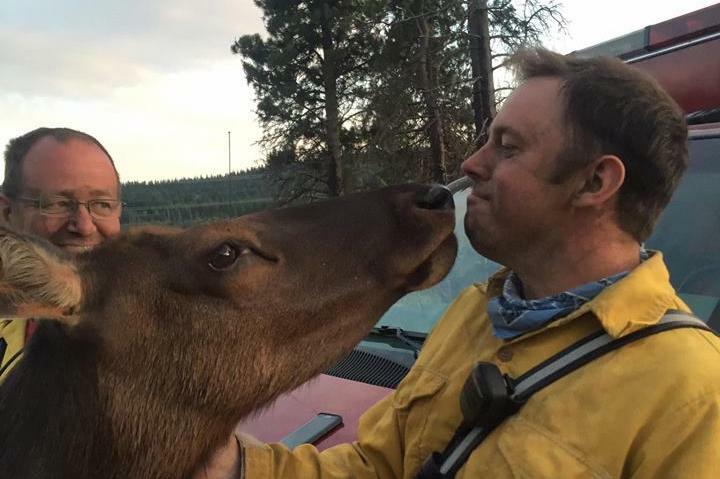 Good or bad, Buttons’ frequent human contact was of concern for the state Department of Fish and Wildlife, which relocated Buttons to the Mellotte elk feeding site in the Wenas Valley north of Selah on Friday. The agency said it was giving Buttons, who weighs 400 pounds, a new start. Buttons had roamed the rural area along State Route 10 between Ellensburg and Cle Elum and interacting with neighbors since at least 2015. She garnered national attention when she wandered into the Hart Road Fire command post in July 2016 and nuzzled the firefighters. Such feel-good stories have increased Buttons’ popularity among the neighbors and those who encountered her, but there are long-term consequences for wildlife that have frequent human contact, said Scott McCorquodale, regional wildlife program manager in Yakima, who is involved in wildlife management efforts in Yakima, Kittitas, Benton and Franklin counties. While an animal might appear to be friendly, it doesn’t mean there’s no risk to humans or the animal, he said. A misstep by an elk could hurt someone. Improper feeding could cause nutrition issues. And it’s not unusual for a large animal to unintentionally damage someone’s private property. The agency had started conversations about limiting Buttons’ human interactions, but when she appeared with a garden hose around her neck a few weeks ago, the Department of Fish and Wildlife finally decided to take action, he said. “It turned out OK this time, but it might not have another time,” McCorquodale said. Mellotte is one of seven winter elk feeding sites in Yakima and Kittitas counties. At each site, elk are given hay once a day, seven days a week during the winter. When the weather gets better, they migrate to other places where they can live off the plants growing in those areas. Unlike feeding sites in Oak Creek, near Naches, and Joe Watt Canyon, near Ellensburg, Mellotte does not provide public access. That ensures Buttons can have more interaction with other elk and protect her from any potential harm or harassment, McCorquodale said. The site has elk fencing that serves as a barrier. Buttons is now with more than 700 elk at the Mellotte feeding site. When she first arrived Friday, she did go off to the side – a sign she was not accustomed to interacting with other elk. Since then, she has started to blend in with the other elk. She has an ear tag that was required because she was tranquilized, but no tracking collar. The hope is that Buttons will learn to interact with other elk, and when the weather warms up she’ll travel with other elk to find food, McCorquodale said. There’s no hard data to show the success rate for relocating an elk or other wildlife they’re trying to wean from human contact, but it was clear it was not ideal for her to stay in Cle Elum and potentially cause further harm to herself and others around her, he said. Grimnes, 50, is concerned Buttons might end up in the hands of poachers and hunters. She said the quiet and peaceful moments Buttons spent with her husband in their yard still make her smile. “She still has a lot of people here who love her,” she said. Another former neighbor, Casey Barkus, said he understands why she was moved, but is concerned that announcing her relocation will cause problems when hunting season comes around. Tamarack, the fly-fishing guide, holds firm to what he’s learned about limiting interactions with wildlife. He’s encountered bears, cougars and other wildlife on fly fishing trips. Tamarack said Buttons became a problem because she got accustomed to interacting with people so frequently. McCorquodale of the Department of Fish and Wildlife said people should avoid feeding or touching wildlife. Published: Feb. 5, 2019, 2:49 p.m.